Editor’s note: Market favorite Primavera, whose meal-worthy handmade tortillas have been popular for years, now has company. And while these new tortillas will make a great addition to your Saturday shopping list, they’re also the kinds of value-added foods that help make sustainable farming possible. Rancho Gordo’s Steve Sando began his heirloom bean business because he felt disconnected from the food he was eating. “I’m just a consumer who was limited in what I could find at the grocery store,” he says. 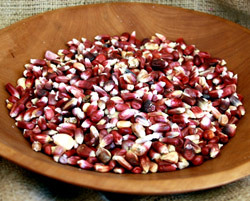 After experimenting with growing his own beans and grains and traveling widely throughout Latin America, Sando eventually chose to commission several small growers to produce the foods he wanted to sell. Today he curates and sells a unique selection of “New World” beans and grains. Rancho Gordo tortillas are made on Saturday mornings at La Palma and sold exclusively at the Saturday Ferry Plaza Farmers Market. There was just one problem. Massa now had a mountain of wheat, but few eaters were baking at home, let alone seeking out local wheat. Initially, Greg brought wheat berries to the farmers market, but there was a finite demand for them. Next, Massa turned to the grinder and attempted selling fresh wheat flour to local bakeries and bakers. But, once again, the market was limited and the wheat mountain grew larger. Determined to avoid the commodity market, Massa and his team began brainstorming other ways to market his goods directly. Although Massa was not prepared to go into the bread business himself, he eventually found his answer in a similar product – the tortilla. Like Sando, Massa searched for a local tortilleria that was willing to make a high-quality product. “We work on a smaller scale and we put a lot of time into all of our products; everything passes through our hands,” Massa says. “So we wanted a small manufacturer who knew how to create handmade tortillas.” Greg eventually hired a company called Micaela’s California Fresh to do the job. 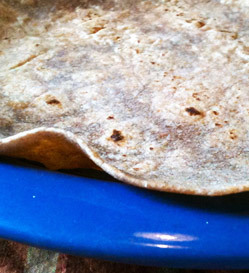 Many flour tortillas are made to have very long shelf lives, meaning they’re loaded with preservatives. Massa Organics’ tortillas are a fresh product made with only their organic whole wheat flour, organic canola oil, baking powder, water, and salt. Massa Organics wheat tortillas are made in Woodland on Thursday mornings and sold at the market on Saturdays. Greg Massa will also be speaking at this year’s Sunday Supper. Jess Goldman blogs at Sodium Girl.